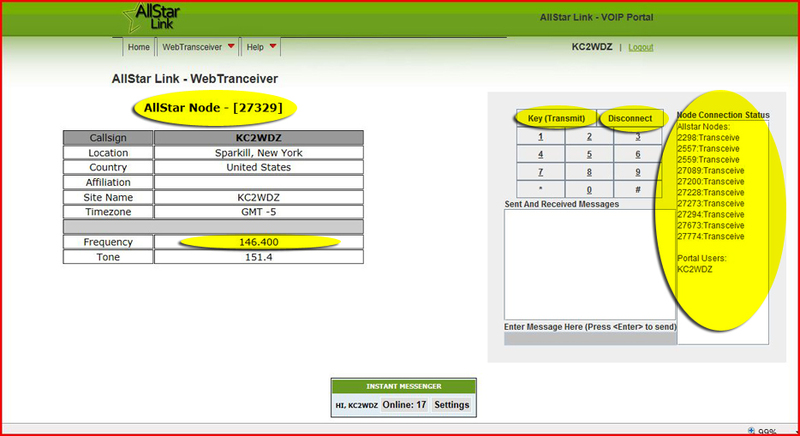 Access the K2ETS repeaters using the All Star Link Network WebTransceiver or using a Phone for when you don't have a transceiver or are located too far away. The following is meant to be a general aid for Amateur Radio Operators who wish to use the All Star Link Network or a regular phone to access a repeater or radio that is controlled by the Asterisk/app_rpt software. Asterisk- an open source Voice Over Internet Protocol (VOIP) software. Which turns a computer into a complete VOIP Phone PBX system. See http://www.asterisk.org/asterisk for more info. app_rpt- an open source modified version of the Asterisk software. It uses Radio Over Internet Protocol (R.O.I.P) to inter-connect radios, repeaters, and amateur radio operators globally. In simple terms, a repeater or radio can be linked to one or more repeaters and radios via the internet. These internet linked repeaters can then be accessed with, but not limited to a web-based transceiver known as the All Star Link Network WebTransceiver. Usually, When amateur radio operators referr to Asterisk, they are referring to the app_rpt version of Asterisk. The All Star Link Network Provides Amateur Radio Operators a way to access a repeater or simplex radio known as Nodes via a computer with a speaker and mic or through a phone. In order to use the All Star Link Network you must first register. After you register you'll have to wait up to a day or more for a confirmation email to be sent to you. Go to www.allstarlink.org and click register. The following is the registration page. You'll need to fill out all the fields and click SUBMIT. It will take a day or more to receive a confirmation email. Once you receive the confirmation email you will be able to log in and use the All Star Link Network. Once you receive the confirmation email, you'll be able to log in and star using the All Star Link Network Portal. After you Log In you'll be at the Welcome Page. Click on WebTranceiver from the menu bar and then click Launch WebTransceiver. After you click Launch WebTransceiver, you will be presented with all the current online nodes which you could connect to. The callsign and location of each node is also given. Scroll theough the list, choose a node number and click it. The WebTransceiver will then open and start connecting. As in the example below, with the WebTransceiver window now open and after the connection has been completed, the Key(Transmit) and Disconnect buttons now become active. Assuming you have a speaker and microphone connected and the audio levels properly adjusted on your computer, click on the "Key" button once to key the mic and transmit. Click on it a second time to unkey and stop transmitting. Some of the other relative information which is given are the AllStar Node Number which you are connected to and the Frequency which that node transmitts on. The "Node Connection Status" bay list all the nodes and portal users (such as yourself) which are connected. So when you click "Key" you not only transmitt on the node which you connected directly to, you also transmit on the nodes listed in the Node Connection Status bay. 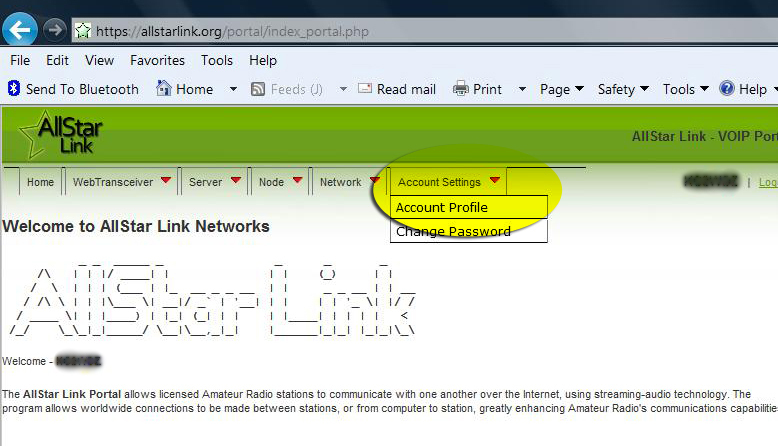 When your finished using the All Star Link WebTransceiver or wish to change the node you are connected to, click "Disconnect"
All Star Link Network Telephone Portal help and info. 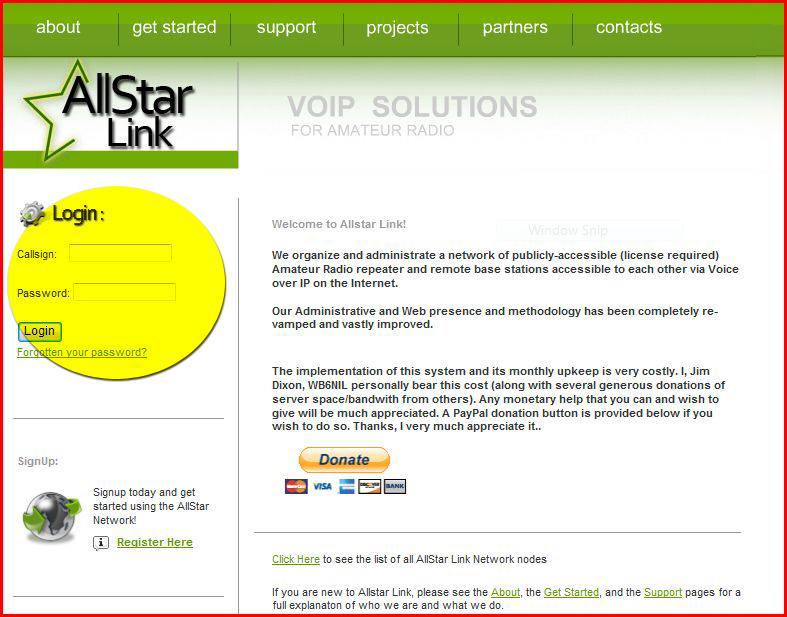 The telephone portal allows radio amateur users of the AllStar Link Network to access the repeater nodes via telephone. The telephone numbers of the AllStar Link Telephone Portal are listed below. You also should have already registered at www.allstarlink.org. 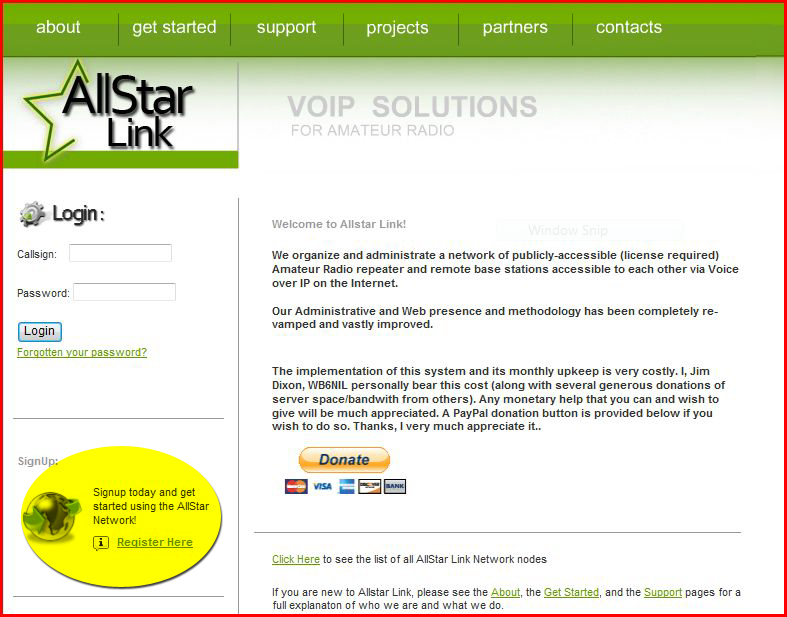 You will need 4 things to access the repeater through the All Star Link telephone portal. Obviously a telephone. Mobile, Land line or Satellite. The node number of the repeater you wish to connect to. 27273 or 27274 for the K2ETS repeaters. The All Star Link Telephone Portal access phone number. The 2 U.S. phone numbers are listed. Your 10 digit AllStar User Security PIN. The AllStar User Security PIN. If you no longer have your 10 digit AllStar User PIN or the confirmation email you received when registering, you can obtain the PIN from the All Star Link website. After loging into AllStarLink.org click on Account Settings and then Account Profile of the top menu. 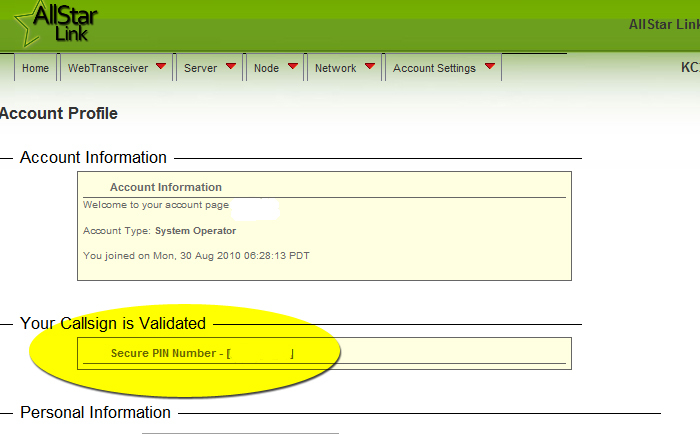 On the Account Profile page, your 10 digit All Star User Security PIN is given under "Your Callsign is Validated". Accessing and using the telephone portal. First dial the number for the Telephone Portal (see above). It will ask you to enter the desired Node number to which you wish to connect to, for K2ETS those node numbers would be 27273 for the 220 machine or 27274 for the 2 meter machine. After entering the nodenumber, follow it by the pound sign. You may then be prompted to enter 1 or 2. If so, enter 1 for node access. You will then be prompted to enter your 10 digit AllStar User Security PIN. Afterwards, the system will prompt you to enter 1 for "Voice Operated" access, or 2 for "Function Operated" access. "Voice Operated" access uses the presence of your voice (or any other noises picked up by the microphone on your telephone) to determine when to make the connected node "transmit". This mode is not recommended in noisy locations. "Function Operated" acess uses DTMF sequences to indicate to the connected node whether you wish to transmit or not. To transmit (like pressing a push-to-talk button on a conventional radio), enter the DTMF sequenc *99, to not transmit any more (like letting up a push-to-talk button on a conventional radio), enter the DTMF '#' (pound) key. While connecting your Callsign will be transmitted as "Connecting".